You won't find many Easter Eggs here but we have lots of new and exciting treasures to tell you about! The first products may be small, as you can see by the mug for scale, but you won't have to hunt far to find them! We were so amazed by the performance of the Musical Fidelity V90 series that we just had to have them. From the top we have V90 Blu, Blu tooth receiver, V90 Amp, V90 DAC, V90 HPA, headphone amp and V90 LPS MM/MC phono stage. It might look like a scaled down separates system but the sound is dynamic and the amplifier packs a far bigger punch than the diminutive casework suggests. With prices ranging from £149 to £249 there is a product, maybe a complete system, to suit everyone. Keeping with the compact and bijou theme we have also taken in Chord Electronics' remarkable Hugo. This is a portable DAC and headphone amp without compromise. Chord Electronics have had an unrivalled track record in digital to analogue conversion since the DAC 64 was launched two decades ago. The beautifully finished alloy casework houses Chord's FPGA (field programmable gate array) circuitry to decode digital signals, DSD timing and for volume control amongst its functions. The sheer resolution of this product has to be heard to be appreciated. Musicality is not compromised and Hugo sounds warm and engaging and is far from sterile and uninvolving. The compact case houses a full set of sockets including two USB sockets, one capable of 32 bit/384kHz, the other for tablets and phones at 16 bit/48kHz plus Bluetooth. Rechargeable batteries make Hugo fully portable whilst the audiophile performance enables it to slot into the very best hi-fi systems. £1400.00 is a very fair price for this level of performance and flexibility. Have a listen and we're sure you will be impressed. Easier to spot in store is our new JVC DLA-X500 home cinema projector. We've always been fans of JVC projectors and are delighted to give this awesome product pride of place in our dem room. The contrast level of the X500 is remarkable. It achieves inky blacks with no loss of detail. The whole colur spectrum is delivered with brightness, vibrancy and a naturalism that is very difficult to achieve at any price level, let alone at the £4995.00 price point of the JVC. Just give us a call to book a demo and prepare to be wowed! For those looking for a discreet and sensibly priced improvement for their TV sound, we have just taken in the Wharfedale Vista 100 soundbar. The compact (810mm wide) enclosure houses a 60W amp driving six neodymium drivers with two located on the side panels to create a spacious 3D effect. This is aided by Sonic Emotion Absolute 3D technology, with modes for Music, Movie and Game. There are optical and coaxial digital inputs plus analogue RCA and 3.5mm minijack inputs, and it has Bluetooth connectivity. And the price for all this? Just £149.95! We thought it sounds great and so much better than the feeble sound which emanates from any slimline TV. Why not treat yourself for Easter? 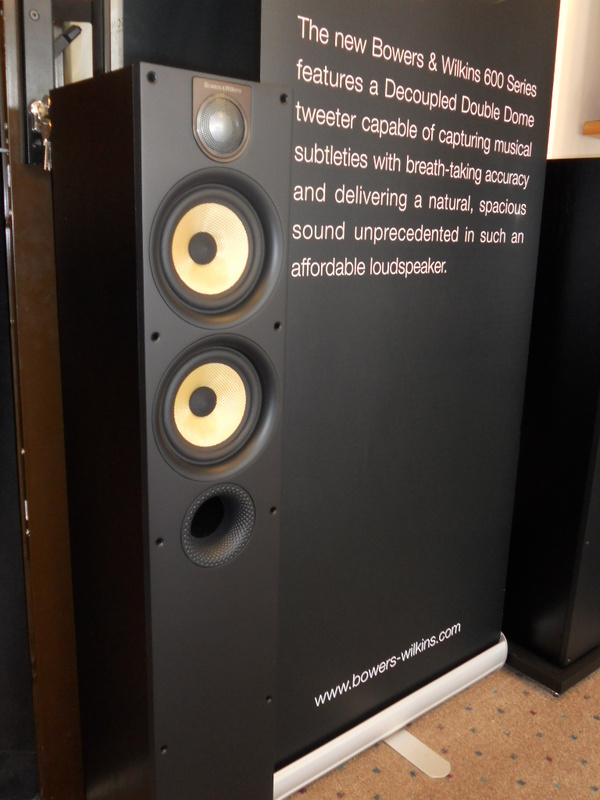 Last, but definitely not least, we now have the long awaited new B&W 600 series in stock and on demonstration. It was well worth the wait! The performance of this new range of speakers is a major step forward. The 684 S2 pictured above is a much more slim and elegant floorstander than it's predecessor and the clarity and openness of the decoupled double dome tweeter fitted to all 600 series models is a revelation for such an affordable range of speakers. With prices ranging from £349.95 to £1149.95 there is a model to suit all requirements, including centre speakers to assemble a home cinema package. Finishes are contemporary black or white and an excellent B&W floor stand (STAV 24 S2) is available for the 685 S2 and 686 S2 for just £99.95 per pair. That's all of our news for now. We hope our range of new products includes something to interest you. P.S. Nearly forgot. Our kettle exploded, literally. It emitted flames and smoke! We now have a new one so rest assured we can still make you a cuppa!